John Hannah was born in East Kilbride in Lanarkshire. After working as an electrician for four years he trained as an actor at the Royal Scottish Academy of Music and Drama. He graduated in June 1985, but his career was already under way, and he first performed at the Palace Theatre in the March of that year! 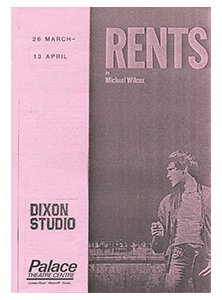 This was in Rents, playing the lead, Phil (he had already appeared in this play, as Robert, in Newcastle-on-Tyne). The critic in the local Southend newspaper regarded his performance in this challenging play – a no-holds-barred look at the gay community in Edinburgh – as “totally convincing”. Underlying his versatility, he performed twice more at the Palace, in the contrasting productions Wait Until Dark (a thriller) and Funny Peculiar (a broad comedy), in June and July 1985. Years later John Hannah was to come to prominence in films such as Four Weddings and a Funeral and Sliding Doors and has starred in the hugely successful Mummy series. His many television roles have included Dr Iain McCallum in McCallum, D.I. John Rebus in Rebus, Jack Roper in New Street Law and Jack Cloth in A Touch of Cloth. Never forgetting his early career, in early 2005 he pledged his support for the Palace when council budget cuts meant the theatre would be closing that October. Speaking of his disappointment at this news, and fondly recalling his time at the Palace, the actor said “I did have a very good time there. It is very sad that it is closing. It has done some great work.” Thankfully, the theatre was only closed for one year before current lessee HQ Theatres took over.